Boss Sled Base Guest Chair [B7309] with Free Shipping! 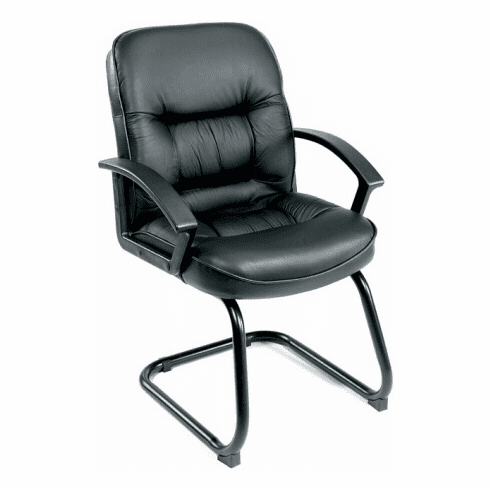 This sled base guest chair from Boss Office Products features LeatherPlus upholstery. LeatherPlus is leather that is polyurethane infused for added softness and durability. Other features include attractive executive styling with gathered seams, built in lumbar support, thickly padded and contoured seat and backrest cushions, full length loop arms, cantilevered sled base and a tubular steel frame for added stability. Matching high back or mid back executive chairs available. This sled base guest chair meets or exceeds ANSI/BIFMA standards. Dimensions: Seat Size: 21"W x 20"D. Back Size: 21"W x 27"H. Seat Height: 23"H. Overall: 38"H x 27"W x 28.5"D. Six year limited warranty from Boss. This chair normally ships within 2-3 business days from either our CA or GA warehouse.